Ottoneu founder/creator Niv Shah once described Ottoneu as an economic system that just happens to be built for fantasy sports. The entire platform is finely tuned to bring the stats, rules, and interface together to provide an excellent overall gameplay experience perfectly suited for baseball nerds. 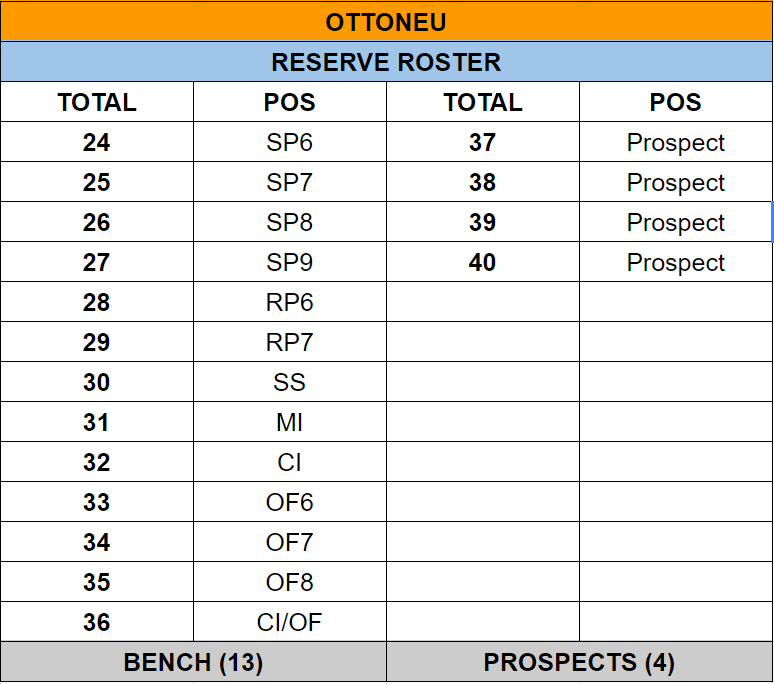 Nerds often like math (which is why baseball nerds love sabermetrics), so let’s spend some time digging into some of the math behind the game of Ottoneu. This will be a blend of benchmarks and strategy, but overall the goal here is to create a reference for Ottoneu owners looking to win their leagues. Building out your bench is less straightforward, as there can be many different routes to success. As a rule of thumb, a competitive team employs some extra arms, a backup at every offensive position (including some extra outfield depth), and a handful of prospects. Knowing how much of your $400 budget to allocate to prospects is a common question but is really a judgement call, as some teams prefer to exit the auction with zero prospects while other owners will draft prospect-heavy reserves. Keep in mind each of your 40 roster spots automatically inherits a cost of $1 whether you actually roster a player or not. In other words, you must have at least $1 available for every free roster spot in order to field a legal team (illegal rosters will lock you out from lineup changes, trades, and any other transactions with the exception of cutting players). It is perfectly acceptable to exit your auction without drafting all 40 players, and it can be prudent to leave yourself some cap space (maybe $8-$12) for roster flexibility, too. The most important numbers in Ottoneu are 1,500 (innings cap) and 1,944 (games cap). Regardless of how you structure your roster, a competitive team must be built to meet these thresholds over a long season where injuries and underperformance can devastate even the most perfectly built starting lineup. This point can’t be overstated, so let me say it again: if you plan to realistically compete in Ottoneu, your primary auction strategy must be to build a roster that can realistically hit the IP and GP caps. Regarding the 1,500 innings cap, it may be helpful to think about building your rotation backwards, estimating 65 innings from each of your five RP slots for a total of 325 innings. That leaves 1,175 IP to meet with your five SP. This is why it’s always wise to budget at least two or three extra SP into your roster because it’s nearly impossible to hit 235 IP with each of your five total starting pitchers (Kershaw threw 232 last season), especially if you want to play various matchups throughout the season with your less effective starters. Also, the 1,500 is a “soft” cap, which means that on the day you exceed the 1,500 IP limit (usually last day of the season), all your pitchers will still receive credit for their stats (sometimes ending with as much as 1,515 total IP). For Ottoneu Classic (4×4), there is a 1,250 inning minimum. A quick note on “pace” of IP and GP: it’s much easier to make up innings in your rotation over the course of the season than it is games played in your lineup, so you’ll want to keep an especially close watch on the “Tools” tab of your Ottoneu league page to track your projected landing for these metrics (you can also find a tracker at the bottom of your lineup page). Some owners will choose to play pitching matchups early in the season to intentionally under-project IP in an effort to catch up later when pitchers get “hot”, though some owners will also choose to over-project their IP for a few months so they can cut back later in case they acquire upgraded arms during the summer. It really just depends on how your team is built and what you’re comfortable with, but with regards to Games Played (offense), you want to try to stay on target as best you can. 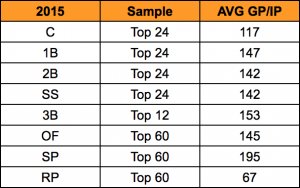 There are a lot of different ways to compete in Ottoneu (which is why so many owners play in multiple leagues, trying different strategies), but what follows are some benchmarks that might help you gauge just what it takes to win your league(s). Average scores of 2015 Ottoneu Old School (5×5) league champions. 2015 league winners in Ottoneu Old School (5×5) averaged a score of 104 (a score of 110 is boast-worthy). One thing to note is that almost without exception, 5×5 winners placed either 1st or 2nd in their league in Runs. Average scores of 2015 Ottoneu Classic (4×4) league champions. The sample size for Ottoneu Classic (4×4) is a bit smaller, but 2015 league champions averaged an overall score of 86 (a score of 90 is exceptional). Just an observation, but it looks like Mike Moustakas was the closest representative 4×4 player of 2015 with 22 HR, a .348 OBP, and a .470 SLG. Key stats from Ottoneu FanGraph Points league champions (2013 – 2015). Offense is scored the same in both FGPTS and SABR leagues, though pitching stats differ slightly as SABR is FIP-based. FanGraphs Points is one of the more popular Ottoneu formats and because of that we have access to a greater sample of data. The takeaway here is that scoring 18,000 total points in a season is an excellent barometer of success (and 20,000 points will most certainly put you near the top), so keep that number in mind as you run pre-season projections for your league exiting your auction. If you’re consistently projecting 16,000 – 17,000 points heading into the season, you’re probably going to ultimately find your team middle of the pack. It’s also important to note that about 55% of your total points will come from your offense, so there’s a good balance built within Ottoneu that may influence your auction strategy. Finally, your P/G and P/IP are your most critical indicators of team performance, though they will fluctuate dramatically over the first few months of the season. (SABR points league data was not available to me at the time of publishing this article, but I hope to update this post in the future once I receive it). Calculating auction values for Ottoneu is a topic for another article (Chad has done terrific work here), but for points leagues, it’s commonly accepted that elite hitters score 1,000 or more points per season (which is 6.2 P/G over a full 162 game schedule). However, elite hitters are few and far between as just 14 reached the 1,000 point mark in 2015. Over the past five years: 9 (2014), 11 (2013), 14 (2012), 16 (2011). Fun fact: Bryce Harper’s 1,340 points last year (2015) were the most points scored by a hitter since Albert Pujols scored 1,443 in 2009. Quick tip: if you’re playing Ottoneu points and are looking for a single stat to estimate offensive value, get familiar with wOBA. Obviously total points for pitchers in Ottoneu points leagues are just as important as they are for hitters but they can be a bit more deceptive because what you need to measure those total points in the context of two variables: innings and points per inning. For example, Cole Hamels scored 1,019 points in FGPTS leagues last season over 212 IP. Matt Harvey scored just three more points (1,022) but accomplished that in just 189 IP. That’s 4.8 P/IP for Hamels compared to 5.4 P/IP for Harvey, who is clearly the much more valuable SP in this case. In other words, you want the highest P/IP possible over the highest number of total IP you can find. Nowhere is this rule more applicable than with relief pitchers, where a 10.0 P/IP reliever can score you almost 200 more points (655) per RP slot over a 7.0 P/IP reliever (455) over the same 65 innings. Likewise, even though you should project about 325 IP from your five relievers (325 out of 1,500 IP), you’ll benefit even more for every additional IP you can throw with your RP than with your SP because even mediocre RP (7.0 P/IP) generally score more points per IP than the best SP (Kershaw was 6.75 P/IP in 2015). 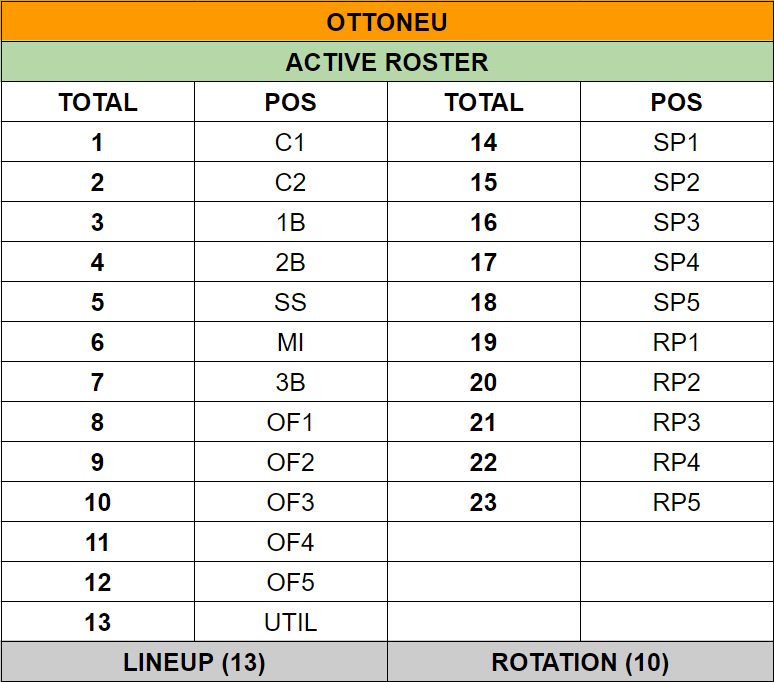 Some of the best teams in Ottoneu points will usually throw nearly 375 IP with their relievers by rotating in a few extra RP on expected “off” days, so use that as a guide. 8/12/16 Update: Joe has written a great, relevant article here on calculating player value. Ottoneu is an exercise in mathletics, a lesson in economics, a 40 piece puzzle, and a season-long round of poker all rolled into one. It’s a blast, but it’s obviously more fun when you compete, so hopefully these benchmarks will serve you well as you get started (you can find out more about joining an Ottoneu league here). Have other Ottoneu benchmarks to share? Let us know in the comments. We hoped you liked reading The Math of Winning Ottoneu (2015) by Trey Baughn! When Notgraphs shut down, I lamented that the effective replacement was Techgraphs rather than a financial/ stock blog. I extend hope that the gap will be bridged. Ottoneu victory is meaningless on my resume and personal bio, but if one were to relate fantasy sport, i.e., Ottoneu, to stock trading, then maybe I could do something with my life.